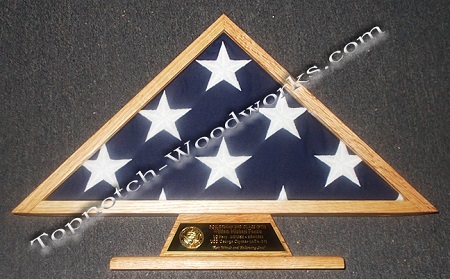 The Burial Flag Case is constructed with SOLID American hardwoods and made right here in the USA. Access from the back panel allows for easy display of a burial flag. Fits the standard burial flag provided by the United States for Veterans, also known as an interment flag. 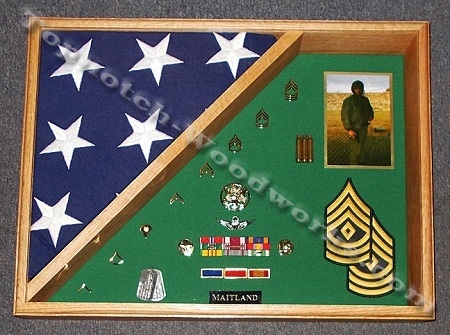 This burial flag display case is handcrafted by a 20 year USAF Veteran. 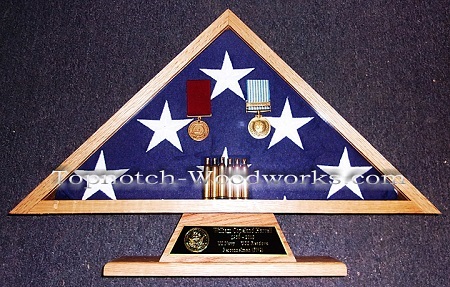 This Veterans Burial Flag Display Case is beautifully crafted, and will provide safe and secure storage and display. 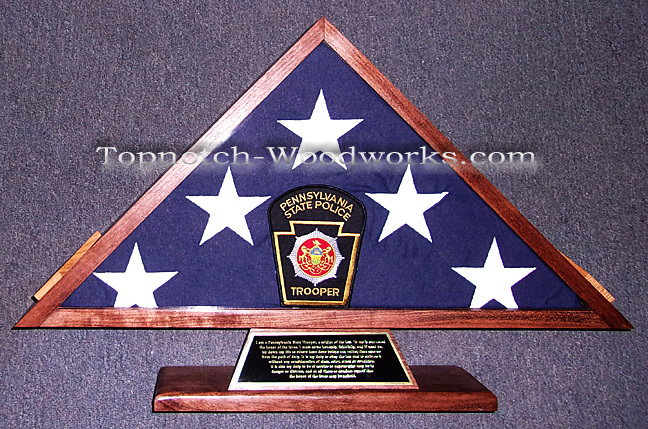 This impressive case is available in Red Oak, Cherry or Walnut and is designed to hold a 5ft x 9.5ft burial flag. Pedestal provides a space for an engraved plate to which you can add the service seal along with text. If you need something special engraved, call us and we'll be glad to help. Text unlimited; we do not charge by the letter. 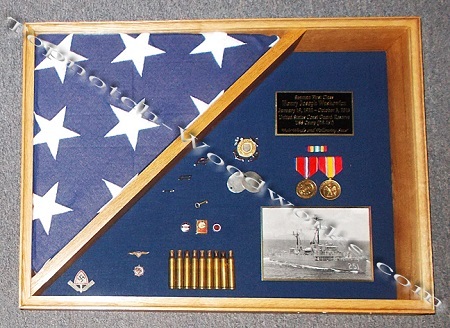 Hi Ken, We received the flag case you made for our Dad in June and it was beautiful—thank you! Greetings, We received the case and it looks great. Gave it to the neighbor who lost his mother and he loved it. Keep up the good work. 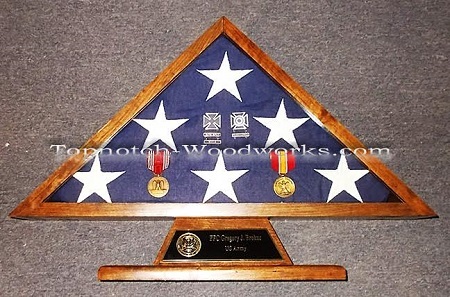 I wanted something special to display my father’s burial flag. There were so many sites where the costs were double or more than Top Notch Woodworks for the same quality. I ordered this back in 2016. My Mom and family said it was so beautiful. I didn’t get to see it until now due to health issues that prevented me from traveling. I was able to bring it home with me to keep for a while and it’s proudly displayed on my fireplace mantel. The work exceeded my expectations. It truly honors my father’s memory and I have suggested this business many times. Don’t let the price fool you. Ken ‘s work is true top notch. Thank you for getting that additional line on the plaque. And thanks for your help with it all! Ken, Just wanted to let you know that I received the flag case today. It is absolutely awesome. Once I put the flag in it I’ll send you a photo. Once again thank you for another great piece. It arrived Friday (Veterans Day). Very pleased, thank you. A fitting tribute to my dad, a WWII veteran. Keep up the good work. Ken, I received the flag case that I ordered for my husband’s flag. It exceeded my highest expectations! Your work is beautiful, and I have received several comments on the quality of the craftsmanship. My husband would be so pleased. Thank you from the bottom of my heart! Ken, I received the flag box yesterday and it’s beautiful!!! Thank you so much! I really appreciate it! I took a picture of it and sent it to my brother, Craig. He thinks it’s beautiful too and is interested in one for his flag from Dad’s service. I’m sending him the link to your web site. I want to thank you for the beautiful display case and the wonderful job you did on the engraved plate. It is truly beautiful. Thank you from me and my family and I thank you personally for serving our great country. God Bless you. Robert Savage. Hi Ken–I received these photos today from my Grandma Bev in Winfield, I can’t believe you had this made and shipped so quickly, and she thinks it’s just perfect. Thank you sooo much!